ALABASTRO - Until the mid-20th century all Treble guitar strings were made in gut, a material that had been used for thousand of years and that combines good promptness of attack and excellent performances. A fundamental aim of Aquila's research has therefore been to design a new synthetic product having the same acoustic properties as gut, but without its typical defects (high cost, short lifetime, high instability under moisture changes). TheSupernylgut® has precisely all these good qualities without all these defects. Its features includepromptness of attack,excellent performances and a trulyremarkable stability ofintonation under moisture changes. The Alabastro Basses, wound with high quality silver-plated copper, consist of a Supernylgut® multifilament core that ensures not only a high resistance to tensile stress but also a low absorption of both atmospheric humidity and sweat. 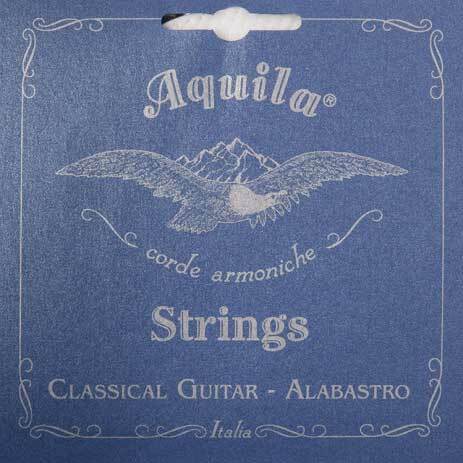 SUPERNYLGUT® is theupgraded version of Aquila's famous Nylgut® strings. The synthetic material Super Nylgut® ("synthetic gut") have the same acoustic properties as gut - but without its typical defects - (high cost, limited duration and high instability under varying climatic). Nylgut has precisely these qualities: allowing one, on the one hand, to rediscover the sonorities familiar to the great 19th and 20th century masters; and guaranteeing, on the other, a stability of tuning higher even than that of the best gut and nylon strings.